Smart strategies to reuse, refurbish, and recycle products and raw materials not only benefit the environment, but also save money and increase profits. While companies struggle at times to find ways to make their supply chains more environmentally friendly, one subset of the supply chain stands out as inherently green: reverse logistics. Because reverse logistics by definition includes processes such as remanufacturing, refurbishment, recycling, reuse, and asset recovery, engaging in reverse logistics activities guarantees companies a certain level of green. “All elements of reverse logistics have green implications,” says Jeff Robe, director of marketing for the Reverse Logistics Association (RLA), a trade organization focused on educating retailers, manufacturers, and third-party logistics providers about the benefits of reverse logistics. “Reverse logistics addresses questions including: At a product’s end of life, can some components be salvaged and reused? Can the materials be ground up, recycled, and made into additional parts? “Recovering products, refurbishing goods, and pulling out parts such as precious metals that can be recycled or reused are green processes, and they bring a huge benefit to the environment,” he adds. It’s one thing to talk about the benefits of sustainability initiatives, but the proof is in the spreadsheets. Let’s crunch the numbers on three companies’ reverse logistics results. Strategy: Partnered with third-party provider to revamp reverse logistics processes. Payoff: Transformed an $8-million cost center into a $147-million profit source. Strategy: Focused on refurbished goods for resale in secondary channels. Payoff: Cut processing costs by 50 percent; reduced returned goods inventory to less than two weeks; tripled product recovery rate; receives up to 80 percent of retail selling price for returned goods. Strategy: Redesigned products to reduce operating energy consumption. Reduced product weight and volume, removed banned or restricted substances, and planned for product disposal. Payoff: Decreased product raw materials footprint by 70 times over the past 10 years. Consumers who purchase a Sonicare toothbrush, decide after a few uses that it’s not for them, and return it, probably never think about what happens to that product after they receive their refund. But for Philips Consumer Lifestyle— maker of Sonicare, Norelco shavers, Avent baby products, and a variety of consumer electronics goods— what happens to returned products is crucial to the bottom line and to its sustainability goals. Because of the nature of their use, returned products such as toothbrushes, shavers, and baby bottles cannot be resold and must be disposed of. But just heaping them in a garbage dump does not meet Philips’ zero-landfill goal. To make sure its products do not end up in landfills, Philips works with third-party logistics provider Ryder Supply Chain Solutions to select partners that can provide proper disposition. Sciarrotta’s division also has stringent environmental guidelines for handling returns of its consumer electronics goods. Together with Ryder, it has crafted a reverse logistics process that helps it refurbish, reuse, and resell nearly 80 percent of these returned goods. Because most of the finished goods returned to Philips Consumer Lifestyle still function well, the key emphasis is on repackaging and reselling these products as refurbished goods— and doing so in a cost-effective and green manner. Returned products are shipped to a 500,000-square-foot facility in Groveport, Ohio, which Ryder operates for Philips Consumer Lifestyle. 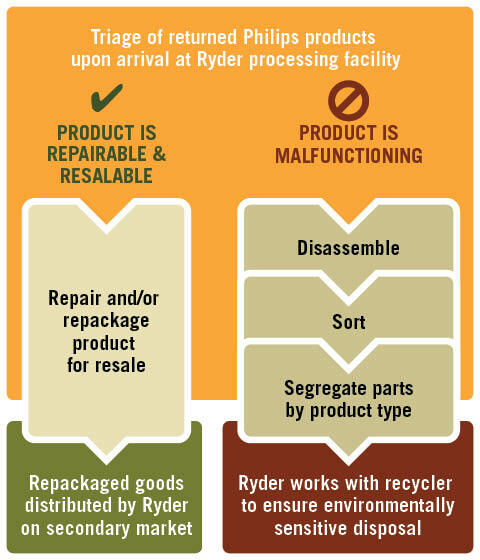 There, Ryder runs a triage operation to determine if goods are resalable or malfunctioning, and whether it makes business sense to repair them for resale, or dispose of them (see chart). If they are to be resold in a secondary market, Ryder manages the distribution of those repackaged goods. If they can’t be resold, Ryder disassembles, sorts, and segregates parts by product type and works with the recycler to ensure they are disposed of in an environmentally sensitive way. Most of Philips Consumer Lifestyle’s returned goods still function well, so the company relies on third-party logistics provider Ryder Supply Chain Solutions to handle returns correctly. To ensure consistency, a technology solution guided by business rules determines how to direct the returned product through each step in the reverse logistics process. Here’s how it works. Ryder also handles reverse transportation for Philips Consumer Lifestyle, consolidating product returned from retailers to “reduce the number of trips, and the associated carbon footprint and costs,” notes Norm Brouillette, Ryder’s group director, supply chain solutions. Having Ryder handle both the reverse logistics processes and forward distribution of repackaged goods out of its Grovepoint facility allowed Philips Consumer Lifestyle to cut its transport costs and fuel use, and leverage its building’s carbon footprint. “Rather than have a separate third party handle distribution and incurring duplicate transportation and carbon footprint costs, we do everything in one facility and cut down on the need for multiple shipments,” Brouillette explains. As an additional green benefit, Ryder uses recycled cardboard and paper rather than petroleum-based products when it repackages and ships returned goods to secondary sales channels. “At our request, they try not to put anything into the waste stream that has a negative effect on the environment,” Sciarrotta says. “We view reverse logistics as the ultimate recycling process,” he adds. For additional information on green reverse logistics, consult the following reports and whitepapers. Reverse logistics industry leaders offer strategies, tactics, and insights to maximizing recovery while minimizing environmental impact. This resource explains the green benefits of reverse logistics and offers tips on determining when to refurbish products and selecting a 3PL for reverse logistics and asset management. This whitepaper examines the areas of environmental concern regarding returned goods, and proposes mechanisms and programs to minimize the impact.